Based in Donnington, Chichester, Bluefish Computer Services prides itself in offering affordable, friendly, fast and reliable Computer Services to home and business customers in Chichester and the surrounding area. Read what out customers have to say about us in our Testimonials section. We provide a whole range of IT services including setting up new computers, laptop and desktop repairs, laptop screen replacements, virus removals and many more services. 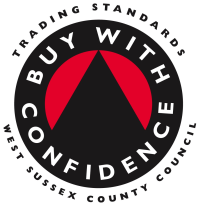 We are very proud and delighted to have been awarded the status of Approved Trader under the West Sussex County Council Buy With Confidence Scheme. We are open 7 days a week from 08:00 to 20:00, because we know IT problems can happen at any time. We pride ourselves on making IT work for you not against you! If you just need some friendly advice over the phone or some further assistance please feel free to Contact Us. "..We had a very positive experience in that all our IT niggles were identified and rectified promptly and with minimum disruption. We would definitely use Bluefish again and would recommend to others."